Introduction: Artificial enzyme mimics are materials with similar catalytic function of natural enzymes. Among several types of artificial enzymes, nanomaterial-based products or nanozymes have been of particular interest to researchers. Materials and Methods: In this work, Ce2(MoO4)3 nanoplates were synthesized via a one-pot hydrothermal approach. SEM and EDS characterizations show a plated-like architecture with high purity. These nanoplates are shown to have an intrinsic peroxidase-mimetic activity. 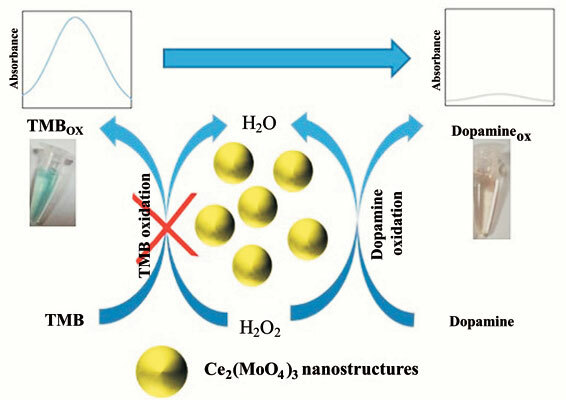 In the presence of H2O2, Ce2(MoO4)3 nanoplates could catalyse the oxidation of 3,3',5,5'-tetramethylbenzidine (TMB) with high performance to produce a blue dye (with an absorbance maximum at 652 nm). Dopamine (DA) has some reducibility due to the phenol hydroxyl group, which results in using H2O2 and causing the blue shallowing of the reaction solution by inhibiting the reaction between H2O2 and TMB. Based on that, a visual, sensitive and simple colorimetric method using Ce2(MoO4)3 nanoplates as peroxidase mimics was developed for detecting DA. Results and Conclusions: Suitable linear relationship for DA was obtained from 0.1 to 10 µM. The limit of detection (LOD) of the proposed method was calculated as 0.05 µM and the relative standard deviation (RSD) was less than 4.0%. The proposed method was successfully applied to DA detection in human serum sample. Nanoplates, peroxidase mimetic, dopamine, colorimetric, cerium molybdate, enzymes.